That's what it says on the vehicle licence plates issued by the Canadian province of British Columbia. And it's true! British Columbia (or simply "B.C." as it's called by many Canadians) is a beautiful province. 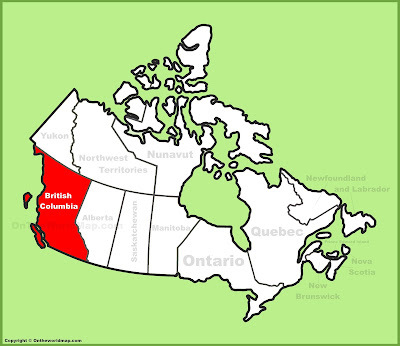 Home to 4.7 million people, British Columbia is the 5th largest province by area, and the 3rd most populated province. Over half of the population is in the area around the city of Vancouver. British Columbia is Canada's most western province, with almost 26,000 kms (16,000 miles) of shoreline along the Pacific Ocean due to the approximately 40,000 islands that make up it's coast. My grandparents had a farm in British Columbia, and I still have an aunt and an uncle living in B.C. And I have many cousins and their families who I haven't seen in a long time. The last time Ruth and I were in British Columbia was in early December of 2007. Almost 10 years ago! We are due for a trip back there sometime soon. 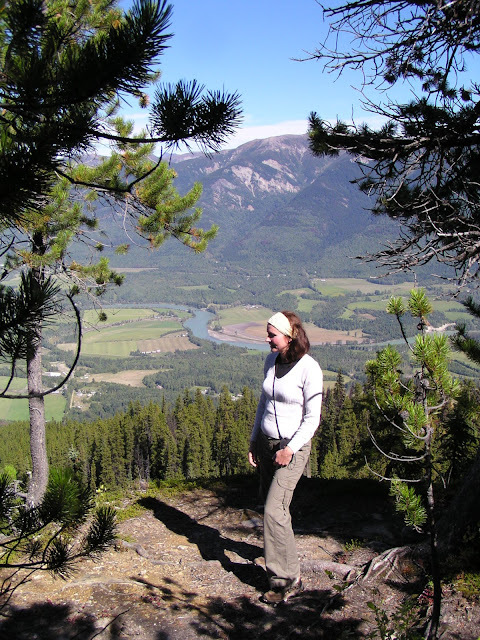 Out for a hike in the Fraser River Valley near Dunster, British Columbia in September of 2006. B.C. hosts the highest number of black bears in the world. They say there are between 120,000 to 150,000 black bears there. In addition, there are also about 15,000 grizzly bears! Besides bears, British Columbia also has the Sasquatch. Or Bigfoot, as it is also called. There have been over 130 reported sightings of the Sasquatch in B.C. Kevin, with the Sasquatch mascot of the Kokanee Brewery in Creston, B.C. B.C. has three UNESCO World Heritage Sites, six National Parks and over four hundred provincial parks, recreation and conservation areas. Actress Pamela Anderson was born in British Columbia. In fact, she holds the distinction of being the very first baby born on Canada's 100th birthday on July 1st of 1967. Ruth lived in British Columbia for three months back in 1980. She was in the city of Courtenay on Vancouver Island. While there, she did the famous 75 km (46 mile) West Coast Trail. My father had done that same hike back in the late 1940's...well before there were ladders and bridges to help you along the way! There are a lot of tourist opportunities in British Columbia. Vancouver itself offers a lot to see, as well as the surrounding area. Near Pemberton, B.C., north of Vancouver. I like the mountains, so British Columbia is probably my favorite province. The first summer we stop working, we'll likely take the motorhome to B.C.! Would like to see some of the northern part of the province, so maybe we'll do that on our way up to the Yukon and Northwest Territories! The waterfalls and wineries set B.C. apart from other places we have visited. So worth a return trip! We loved the scenery in BC but I don't know if I could put up with all that rain and gloomy weather. Thanks for this post. Agreed! The scenery is out of this world with the beautiful snow covered mountains. We have never spent a summer there so I don't know how much rain they get then but certainly lots of rain and gloomy weather in the winter, we wouldn't be happy with that either. Spent some time there in the mid 70's hope to get back that way again someday soon. It sure is beautiful. Yep, I remember being in British Columbia our first year in the motorhome in November and we rarely saw the sun but the stunning scenery made up for it. Can't wait until we are able to head that way for late spring, summer or early fall. Love BC and wish I could move there but we have heard that the healthcare for seniors is not so great. Have talked to several seniors who have moved there and no moving out due the high cost and long wait with health care. We haven't really looked into the healthcare there because we know it isn't a place that we would live. Sure can't wait to go back there and explore the province more though. I think it would take us forever to see it all. Though we've been in BC several times, there's positively no way to see it all! (Ain't that the truth about nearly everywhere?) 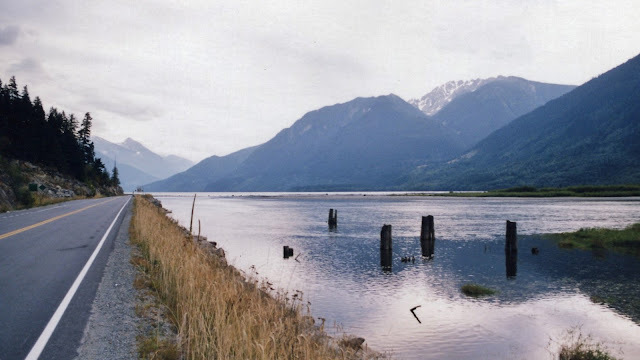 We plan to be in beautiful BC later this summer in our motor home, and we'll scope out more! We are jealous that you are going up there to explore, we sure look forward to the time when we don't have to work anymore and can do the same. Have fun and enjoy your time in British Columbia. We are leaving Ontario in October and plan to visit B.C. I've never been before and I'm looking so forward to it. Beautiful pictures! British Columbia is beautiful just be prepared for some cooler/cold weather at that time of year. We spent a fair bit of time there in November 2007 with our motorhome the first year we started to fulltime in it. We are thinking of takign a trip to BC for a few weeks in August- before we head south in Sept/ Oct..is there much for boondocking in BC? Thinking of the Fraser Valley and National parks areas. British Columbia is like anywhere else there can be a lot of boondocking possibilities if you look for them. I believe that many logging roads have boondocking on them but they can be quite a distance off the road. There is a website to find them but I am not sure what the site is called. You can't boondock anywhere within a National Park but you can if you are just outside of the boundry. A good app we use when looking for boondocking spots is ioverlander but we also are good at finding our own. It was a blustery day! This mom is going to be busy! 33 years and the adventure continues! Even the packaging is impressive! How to save money grocery shopping! You can almost watch the leaves opening up!